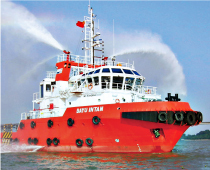 The Bayu Intan is a medium-sized Anchor Handling Tug & Supply Fire Fighting 1 Vessel built in 2005 for Worldwide Operations to Service and Tow Drilling Units and Support Production Platforms. With a 200m2 deck, she has a Bollard Pull of 50 tons and 150 ton anchor handling capacity. The Bayu Intan can accommodate a crew of 24 and is specially equipped for Fire-Fighting, Safety Standby and Emergency Evacuations.